Clipped into fantastical topiary, planted in a pattern to create a parterre, or simply lined-up as classic hedge, boxwoods are team players in the landscape. They’re easy care, tidy, drought-tolerant once established, and generally fuss-free. And deer don’t usually eat them. Sound good? The secret to working with these evergreens is choosing the best selection to fit your vision and growing conditions. Find out more about our top picks and how to keep them healthy. Whether in a formal setting or a casual situation, boxwood is always up for the task thanks to its versatility. In winter this shrub’s strong shape, rich green color, and air of old-world formality dominates the garden, taking center stage. In summer, when the garden is in full-bloom, they meld into the background providing structure, enhancing without competing. While the most familiar forms are what are commonly referred to as "American" (Buxus sempervirens) and "English" (Buxus sempervirens 'Suffruticosa') boxwood, there are about 90 species and over 365 different cultivars, including Japanese and Korean varieties. Different boxwood plants and species vary tremendously in size, shape, leaf characteristics, growth rates, and hardiness. The secret to working with these evergreens is choosing the best selection to fit your vision and growing conditions. Here are our top picks and ways to use them. 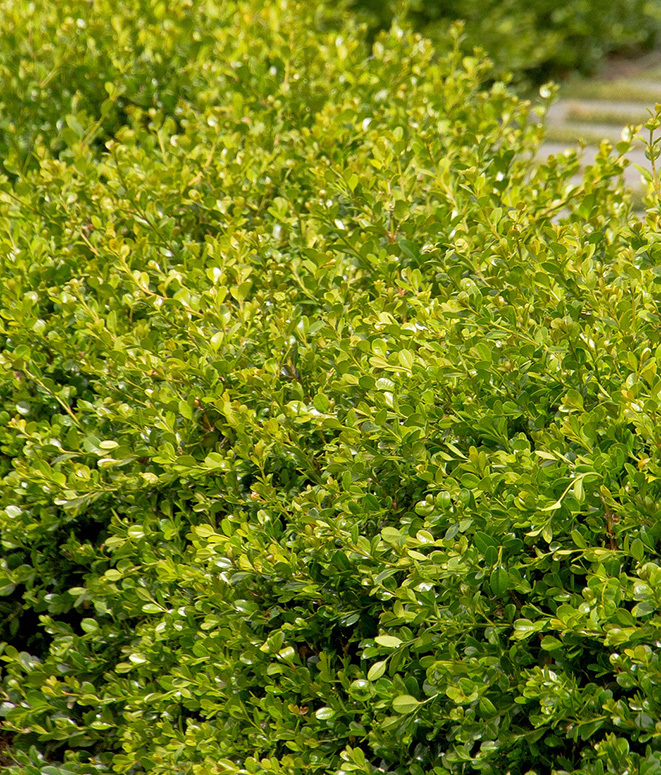 Japanese boxwood is considered to be one of the most adaptable species of this plant. 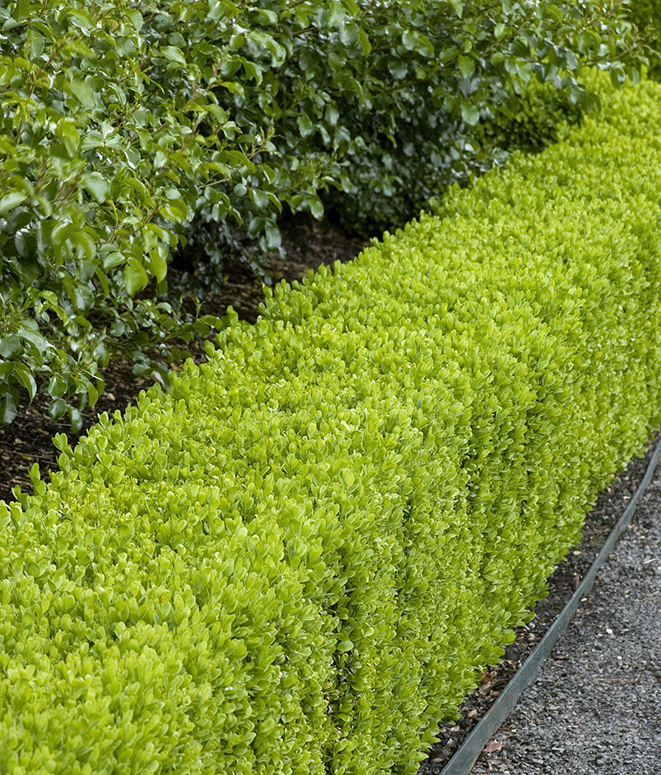 Its dense, evergreen growth makes it perfect for shearing into a small, formal hedge. Evergreen. Moderate growing, 4 to 6 ft. tall and wide, when unpruned. 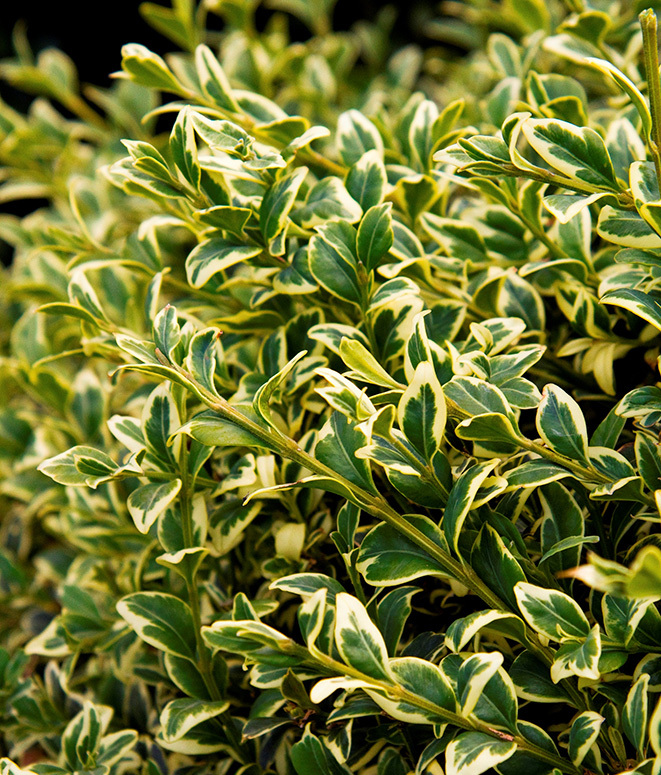 Like the traditional English boxwood, the variegated cultivar has small dark green leaves borne on dense limbs that can be sheared. Evergreen. Slow growing, 5 to 8 ft. tall and wide. More heat, humidity, and drought-tolerant than other English boxwood varieties. Evergreen. Moderate growing, 4 to 6 ft. tall and wide when unpruned. Gardeners have been clipping boxwood shrubs into tight formations since 4,000 BC when the Egyptians picked up some shears and went to work. From parterres and knot gardens to defined borders along walkways or beds, low-growing boxwoods such as these three help you play with structure. Yes, it’s slow growing, but if you’re after the classic, low, tightly clipped boxwood hedge, this one’s for you. Considered to be the most resistant to boxwood leaf miner. Evergreen. Reaches 1 to 2 ft. tall and wide. 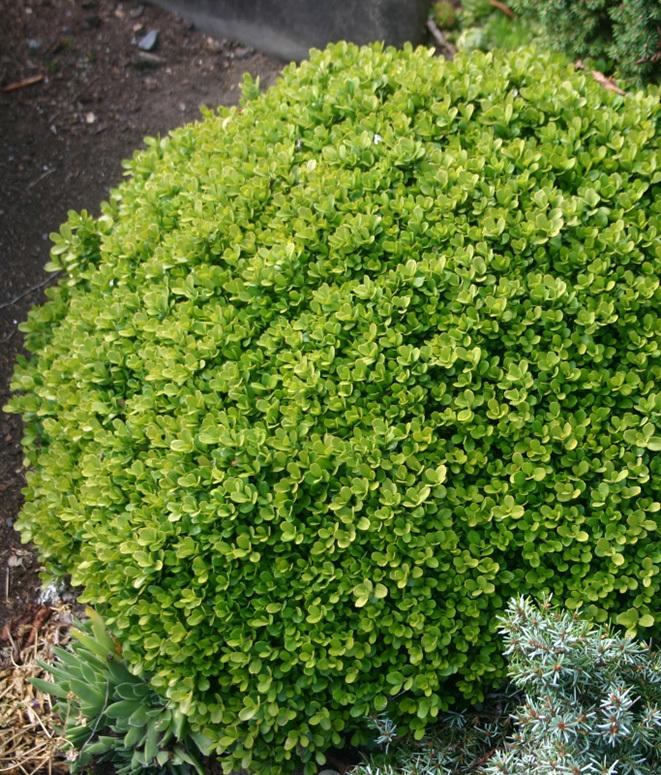 This versatile dwarf Korean boxwood cultivar has neat, dense, maintenance-free foliage on a compact, mounded shrub. Foliage retains its emerald green color throughout the coldest winters. Evergreen. Reaches 2 ft. tall and wide. 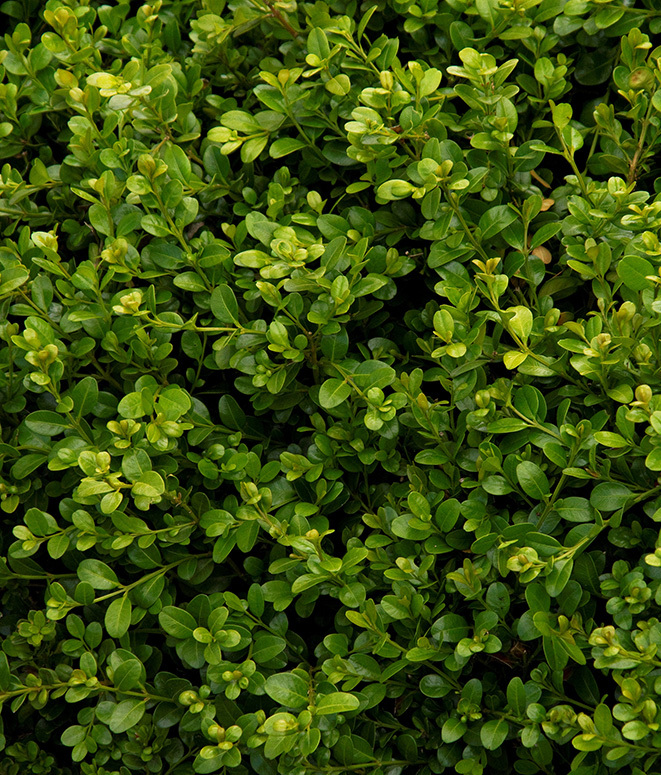 Superior Japanese dwarf selection offers tidy, dense and compact foliage; use for edgings and small hedges or in containers. Evergreen. Slow growth, 12 in. tall and 18 in. wide. 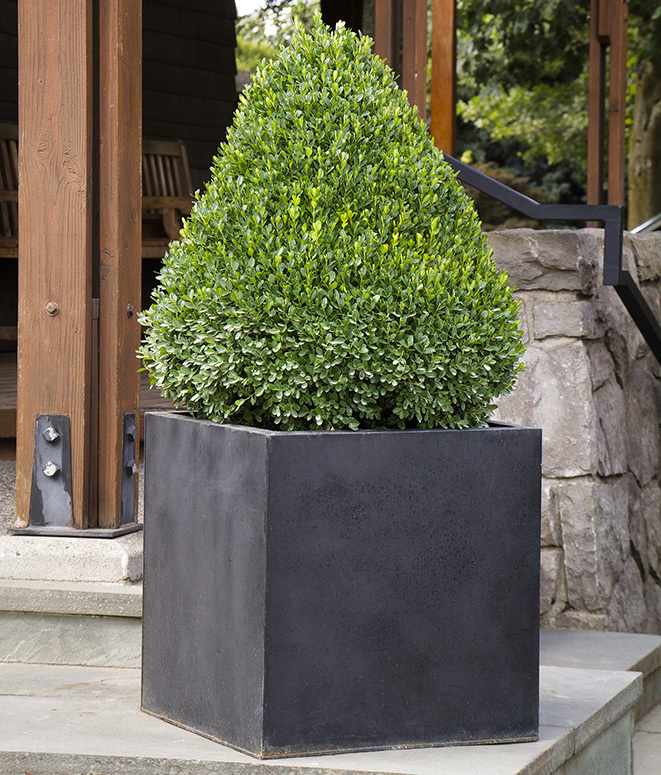 A cold-resistant boxwood that holds its green color well in winter. A superior low hedge both sheared and informal. Excellent foundation plant or as background for perennials. Evergreen. Slow grower, 3-4 ft. tall and wide. Glossy, bright green foliage is densely packed, becoming bronze tinged in winter. An exceptional specimen for container or landscape. Easily shaped into a tidy hedge or topiary form. Evergreen. Reaches 4 ft. tall and 3 ft. wide. Green Velvet (cross between common and Korean boxwoods) is slow growing, super cold hardy, and if left alone, it will naturally take on a rounded shape. Experiences minimal winter bronzing. Evergreen. Reaches 3 to 4 ft. tall and wide. Very columnar growth makes it an ideal specimen for topiary. Medium to finely textured foliage does not brown out in winter. Evergreen. Naturally grows in a columnar form to 9 ft. tall, 1 to 2 ft. wide. Upright, naturally cone-shaped form makes it an excellent candidate for topiary forms--and a striking container or formal garden accent. Evergreen. Moderate growing, 5 ft. tall, 3 ft. wide. 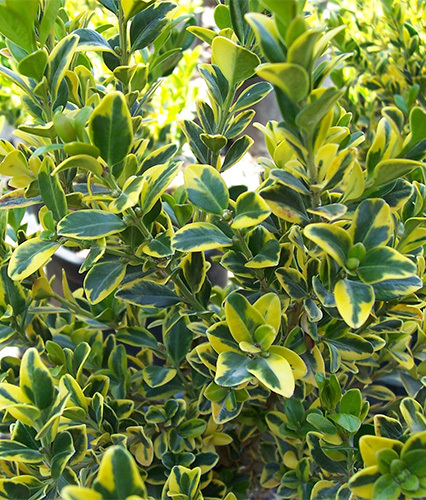 Low-growing, very hardy compact Japanese boxwood; shiny green foliage with showy golden-yellow margins creates a great contrast. Performs well in the heat. Evergreen. Low-growing to 2 to 3 ft. tall, 3 to 4 ft. wide. 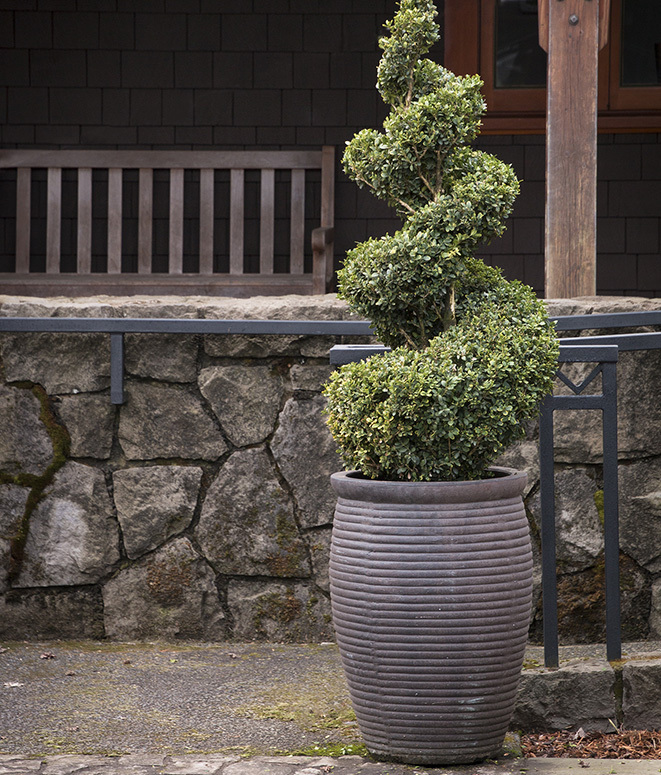 Just about every boxwood is a candidate for a container because they look just as good in January as they do in June. Choose a fast-draining pot that is at least as wide and tall as the plant itself and preferably bigger. The larger the container, the more soil it holds and the less often you have to water. 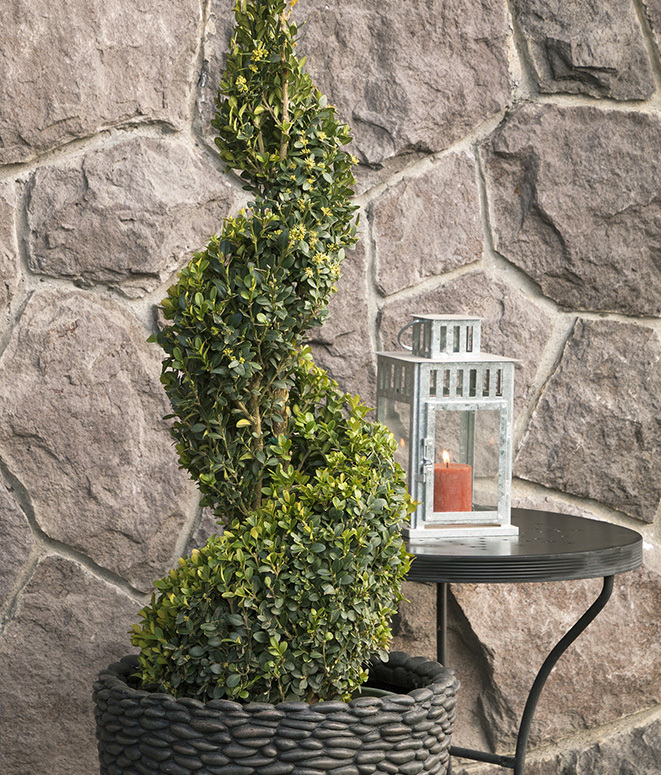 An exceptional new dwarf boxwood with a natural columnar form. Perfect for creating a hedge or accent in tight spaces, requiring little to no shearing to keep its neat shape. Slow growing, 2-3 ft. tall, 2 ft. wide. 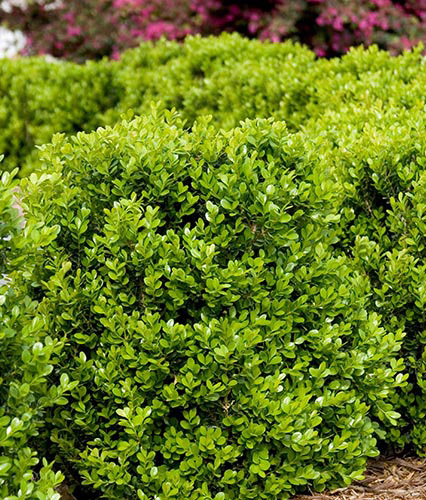 Provide excellent drainage: Boxwood is highly adaptable to various soil types, including average or poor soils as well as acidic or alkaline provided the soil is well-drained. 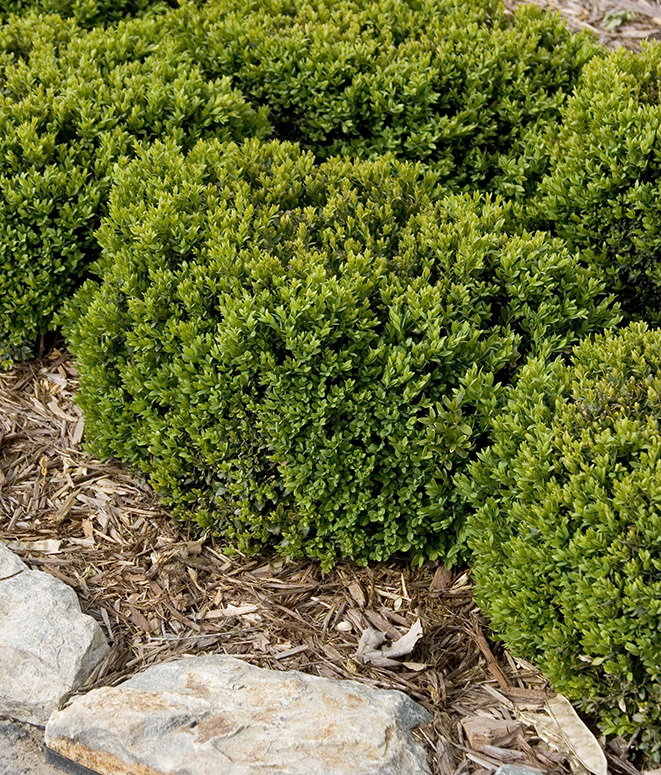 Boxwoods can't take standing water and heavy, wet soil, which can lead to root rot. Prevent by amending soil with lots of organic matter and planting high when installing. 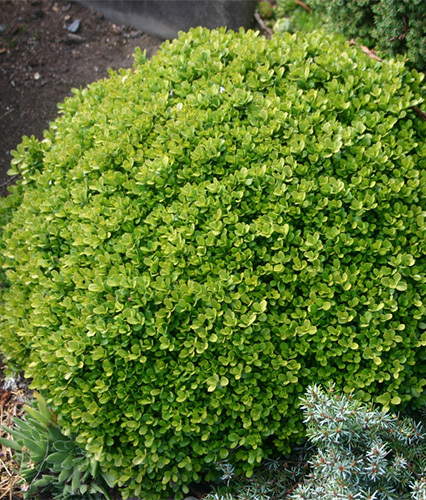 Keep it clean: When a boxwood is sheared to produce denser outer foliage, air circulation is inhibited, light is prevented from reaching the inner sections of the plant and dead leaves and stems accumulate in the center of the plant, all of which can promote fungal diseases that can cause potentially fatal dieback. Prune back all dying branches to healthy wood, remove all debris from the center of the plant, and thin out some of the outside growth so that air and light can reach the center. Exposure: Boxwoods thrive in full sun or light shade, but they don't like exposed, very windy sites, particularly in winter. 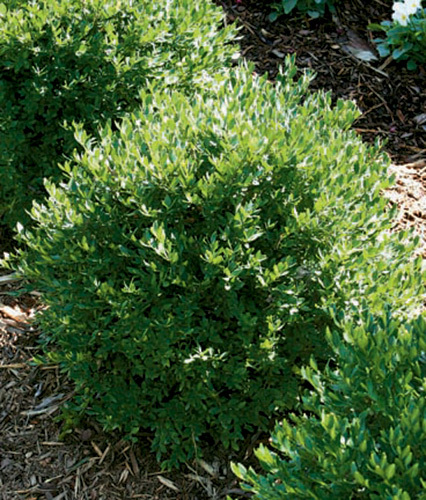 Protect boxwoods by keeping them vigorous and healthy, watered as needed in late and apply a fresh layer of mulch in fall to help prevent winter damage. Fertilizing and watering: Apply a balanced, all-purpose fertilizer (10-10-10) in spring to encourage leafy growth and again in fall to promote root growth. Monthly application of compost tea and use of drip irrigation, which might mitigate blight, can help maintain their health. Back from the brink: If you have a younger, smaller boxwood that’s not doing well, prune back the dead branches, open up the center of the plant, sprinkle one or two cups of a slow-release fertilizer around the shrub, and water it in. If your plant is older, one of the slower-growing varieties, or taller than 3 feet, the time to recover makes trying to save it impractical. Replace it with a new one. For more information, visit Monrovia.com.